Bishop Hartley’s Cody Kirkbride knows what to do when it’s the final few seconds of the Div. IV state championship football game and the outcome is on the line: Grab the football and be a hero. In the title tilt a year ago, Kirkbride’s last-second interception sealed the Hawks’ 31-28 win over Steubenville. On Friday, at Ohio Stadium, it looked as though the Big Red might turn the tables on the Hawks. With the score tied and 1:32 to play, Steubenville lined up for a 41-yard field goal. The kick was well short, and Kirkbride plucked it out of the air. Just about the best possible thing happened, as Kirkbride raced 59 yards down the left sideline and was finally caught at the 23. Four plays later, and with 2 seconds on the clock, sophomore Matteo Agriesti lined up for a 26-yard field goal. A Hartley offside penalty turned it into a 31-yard attempt. No problem: Agriesti spilt the uprights and the Hawks had their second consecutive Div. IV state title, and fourth overa ll. 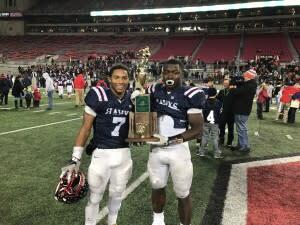 The Hartley/Steubenville classic was one of the seven Ohio High School Athletic Association (OHSAA) state championship football games held at the historic Shoe on Thursday, Friday and Saturday. Five of the games were decided by seven points or less. “I’m gonna go to bed for a month,” a drained St. Xavier coach Steve Specht said a minute after his team’s 27-20 double-overtime victory over St. Ignatius in the Div. I championship game. The Wildcats became the first five-loss team in the long history of the state playoffs (that date back to 1972) to win a championship. 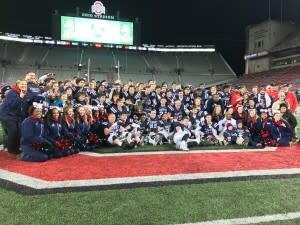 This was the third state title for Hartley coach Brad Burchfield, and he knew what to do after the winning field goal, and how to line up his team one last time. “Move back, move back, so we can see the (Block) O,” the amazingly calm Burchfield told his team as they gathered at midfield for the traditional championship-trophy photo. The seven games drew a total of 55,421 fans, including the family, friends and classmates of the 14 teams. He was sitting next to Jared Croswell, the left tackle on the title team. “It was pretty amazing to play here at the Shoe, it’s like nothing else,” said Croswell, who wrestles at Muskingum University. Walker is on football team at Wittenberg. Tom Cousineau never had the chance to play in a state championship game. His senior season at Lakewood St. Edward was 1974, and only 12 teams in three divisions qualified for the playoffs. St. Edward was a very good team, but didn’t qualify. This year, 224 teams qualified for the playoffs. Cousineau, who went on to be an All-American linebacker at Ohio State and play in the NFL, was the honorary captain of the Div. IV game. “Only a few get a chance to be part of something like this and you carry it with you for the rest of your life,” he said. Two years ago, as an assistant coach at Lakewood St. Edward, “linebackers, of course,” Cousineau “finally got my ring,” as the Eagles beat Huber Heights Wayne. Jeff Backes was the honorary captain for the Div. I game. Backes was a member of the 2000 Upper Arlington team that won the Div. I state title. He rushed for more than 3,000 yards that season, was named “Mr. Football” and played at Northwestern until a series of shoulder injuries and surgeries cut short his college career and goal of playing in the NFL. Backes is an orthopedic surgeon, and joked that he hasn’t operated on any of his Golden Bears teammates. Yet. But they do stay in touch. And to celebrate, Backes and his teammates gathered later that night at the home of Kurt Federer (the center on the team) to watch the video of their 15-9 win over Solon and reminisce.